As a gardener, there’s a good chance that you’ve had your fair share of battles against weeds invading your lawn. Weeds are a persistent problem for many homeowners, and they can be nearly impossible to eliminate without the help of special products. Weed killers, also known as herbicides, are one of the most effective and affordable ways of getting rid of unwanted plant growth in your garden. Here, we go over some of the best weed killers that can keep your lawn looking its best. Not all weed killers target the same plants, and so it’s important to know what you’re dealing with before choosing a product. Annual weeds such as crabgrass and foxtail, for example, need a different treatment than persistent perennials such as dandelions. You can find databases that can help you to identify local weed species either online or at educational institutions in your area. The Weed Science Society of America also offers a number of identification resources for gardeners living in states across the United States. If you’re having trouble getting to the bottom of a weed problem, you may want to talk to an expert at your local nursery or home improvement center. They’re likely to be well versed in which plants pose a common problem for gardeners in your area. Once you know what types of weeds you’re trying to eradicate, you can choose the best weed killer to address your problem. Here are some of the most important things to consider when looking for an effective herbicide. The emergence of a weed killer specifies at what life stage the products targets plants. Pre-emergence weed killers prevent plants from germinating, killing weeds before they have a chance to take root. In general, it’s best to apply pre-emergence herbicides in the springtime, about two to three weeks before plants begin to germinate. Some pre-emergence herbicides can be combined with fertilizers, allowing you to care for your garden while also eliminating future weed problems. Post-emergence herbicides, on the other hand, target weeds that have already sprouted. 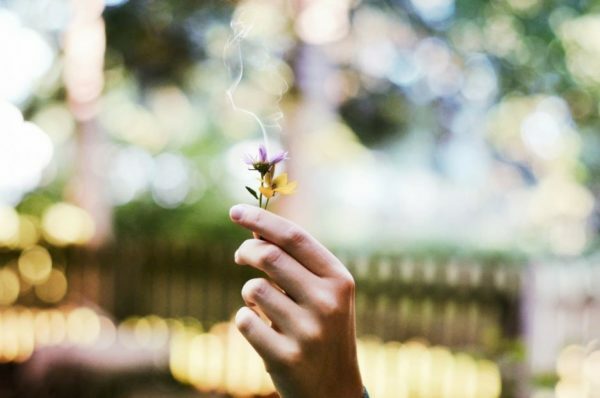 After spraying the product on the leaves of a plant, toxic components infiltrate its system and cause it to die. If you have an annual influx of weeds or crabgrass, you most likely want to opt for a pre-emergence herbicide. The right product can stop your weed problem before it starts. For established growth, however, you’d be better off looking for a post-emergence product. Some herbicides are non-selective, meaning that it will kill any plant that it contacts. This includes both weeds and other plants and grasses. A selective herbicide won’t kill everything it touches, but rather, targets only certain plants while leaving others unaffected. This feature allows you to use the product on your lawn or garden without having to worry about it damaging other plants. Selective herbicides will tell you which species they target on the label. It’s important to make sure that the product won’t harm any other plants in your garden, as some selective products will kill popular grasses such as St. Augustine or Bermuda grass. Most weed killers are contacted solutions, meaning that they have to coat a plant to destroy it. This type of herbicide good for killing annual weeds such as bindweed, crabgrass, and nettles as well as their seeds to prevent future growth. Contact weedkillers work fast, with wilting visibly in as little as a few hours. This type of herbicide only affects leaves and stems above the soil, however, which often leaves roots alive and intact. With frequent applications, however, unwanted plants will eventually weaken and die. Systemic weed killers, unlike contact solutions, penetrate deep into a plant and its root system. The herbicide prevents the weed from photosynthesizing, inhibiting its growth and eventually killing it. While it can take weeks for these products to work, the result is often long-lasting. Systemic herbicides are often the best solution for getting rid of weeds that spread via their root system, including many perennials. If you’re fighting off bindweed, poison ivy, ragweed, or dandelions, it’s best to look for a systemic product instead of a contact solution. The herbicide that you use and how you use it will primarily depend on what type of area you’re trying to treat. Here’s how to tackle some common areas where you might find weed growth in the spring and summer. When eliminating weeds growing on your lawn or in your garden, you want to get rid of the invasive plants without harming your grass, flowers, or vegetables in the process. For lawn and garden care, it’s best to look for a selective weed killer that targets the species with which you’re dealing. You should also aim to find a pre-emergence product as well to stop seeds from sprouting, as it can be a challenge to treat weeds in your lawn after they’ve already sprung up. You should apply weed killer to your lawn or garden in the early spring or late summer, depending on when the weeds in your garden typically germinate. If you’re using a selective herbicide, you can use a spreader or sprayer for full lawn coverage. When dealing with concrete areas, you don’t have to be quite as careful as with a lawn or garden. If you’re trying to completely eliminate any growth from cracks in the driveway, patio, or sidewalk, you can apply a non-selective product to the area. You can use pre- or post-emergence products depending on whether you’re trying to eliminate a problem or prevent future growth. Looking for the right weed killer can be overwhelming, given all of the available options. Here are some of our top selections when it comes to effective herbicides. This post-emergence contact weed killer contains glyphosate as its main ingredient. It’s non-selective, making it a good choice for those who want a powerful solution to weeds growing around walkways, fences, flowerbeds, and more. Compare-N-Save kills plants at the root so that you don’t have to apply the product multiple times. The formula is also designed to break down in the soil so that you don’t have to worry about it affecting future plant growth. To use, mix between 1.5 and 2.5 ounces of concentrate with one gallon of water, depending on the hardiness of the plants you’re treating. It’s best to apply on a dry day, as it takes two hours for the formula to become waterproof. It takes between two and four days to see visible results. Since Compare-N-Save kills the entirety of the plant, you won’t have to worry about new growth in the days following treatment. We love that Compare-N-Save is more affordable than many competing brands when it comes to effective herbicides. As a concentrate, you can also get a lot of use from a single bottle, giving you more bang for your buck. Kills plants from the root for long-lasting results. Targets both annuals and perennials. Ideal for driveways, walkways, and around gardens. It takes a few days to work. Can’t be applied on rainy days. A non-selective formula kills all vegetation. 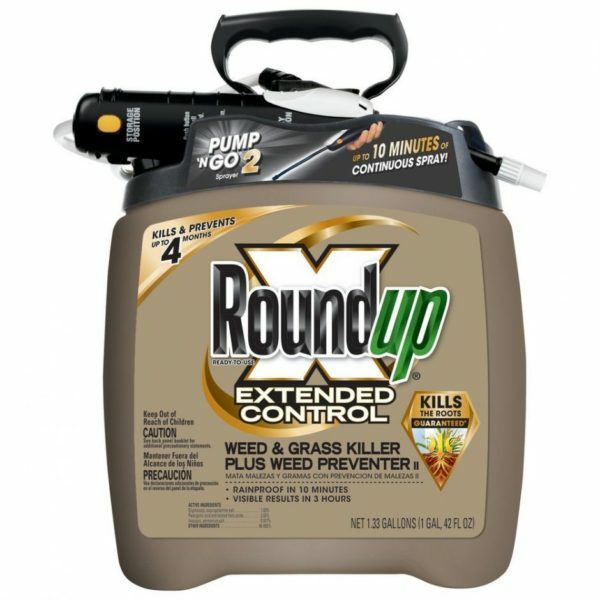 Roundup is one of the most popular brands of herbicide around, and it’s little wonder why. The formula is effective at killing any plant it comes into contact with and has glyphosate as its main active ingredient. This contact weed killer not only eliminates unwanted plants in as little as three hours but can also prevent new weeds from popping up in the area for up to four months. As a powerful non-selective herbicide, it’s best to avoid using Roundup on the lawn or in the garden. This weed killer works best on patios, walkways, driveways, gravel areas, in mulched beds, and along fence lines and foundations. While most products require you to use specialized equipment to spray your yard, Roundup Extended Control comes with its own built-in delivery system. The “Pump ‘N Go Sprayer” has an extendable wand that’s easy to connect and pump, allowing you to start treating your garden right away. The system provides up to ten minutes of even, uninterrupted spray to give you the best possible results. After spraying, it only takes ten minutes for Roundup to become waterproof, making it ideal for gardeners in rainy or humid areas. Comes with its own spray delivery system. Kills a wide variety of plants. Prevents regrowth for up to four months. Waterproof in just ten minutes. Visible results in as little as three hours. Can’t be used on lawns or in gardens. If you’re looking for an organic alternative to the often-harsh chemicals found in most major herbicides, Dr. Kirchner offers a safe option. It uses ocean water and food grade vinegar to tackle weed problems in the garden. This herbicide requires no mixing, and it’s gentle enough that you don’t need to worry about safety gear. It’s safe for both kids and pets, and you won’t have to worry about getting dangerous chemicals on any edible plants. Dr. Kirchner Natural Weed Killer is also safe for the environment. It won’t contribute to dangerous runoff that can harm local forest and marine life. With its non-selective formula, Dr. Kirchner penetrates down to the root to eliminate regrowth for weeks to months. It takes between just twelve to twenty-four hours to work. If you tend to wait long periods between weed treatments, you don’t have to worry about Dr. Kirchner going bad. The formula is shelf-stable for up to four years. 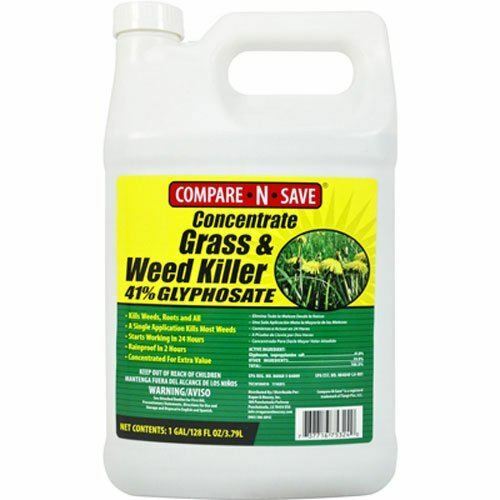 This herbicide kills weeds on contact, and so it’s best to use around paved areas and garden edges. If you use it on concrete, gravel, or rock, it won’t leave a stain once dry. No chemicals that may harm pets or children. Shelf-stable for years without losing effectiveness. Can take up to a day for visible effects to appear. Can’t be used on the lawn. This selective weed killer is designed to target broadleaf species such as dandelions, poison ivy, chickweed, and clover without affecting your grass. 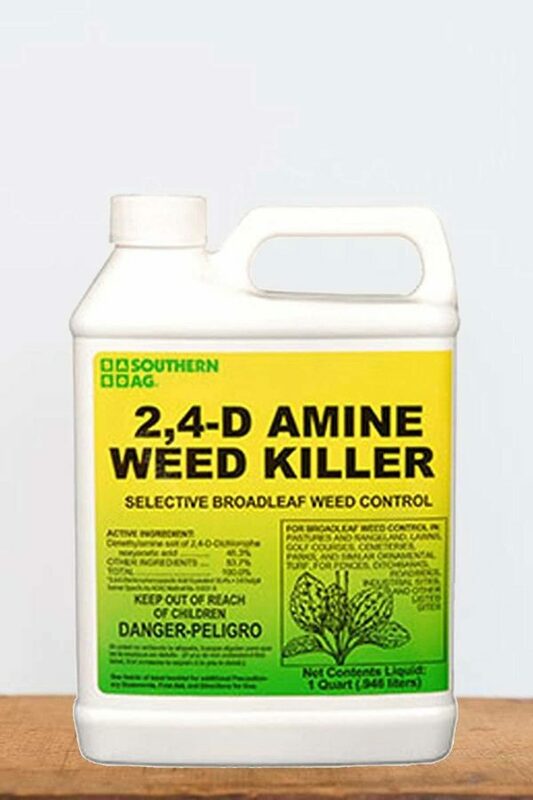 Southern Ag Amine Weed Killer can safely be used just about anywhere in and around your yard, including your lawn. It’s also ideal for public areas such as parks, golf courses, ditch banks, and more. The active ingredient in this weed killer is 2,4-D, also known as 2,4-Dichloro-acetic acid. It’s post-emergence, allowing you to tackle existing weed problems that are plaguing your lawn. While many other selective herbicides tend to kill grasses such as St. Augustine grass, this product has no such problem. It leaves just about all grass species untouched while it works. This weed killer is affordable when compared to other similar products, and a little bit goes a long way. Combining just two to three tablespoons in three to five gallons of water can cover up to 1,000 sq ft of space. It’s easy to apply Southern AG Amine Weed Killer to your garden in as little as an afternoon. Simply mix and apply as a coarse, low-pressure spray using a fan type nozzle. Try to avoid too much overlap. Easy to apply to lawns and gardens. A selective formula won’t kill desirable plants or grasses. Ideal for public outdoor spaces. Targets the most common broadleaf weeds. A small amount can cover a large area. Able to kill grown plants on contact. May not kill all weeds. This is another selective weed killer that targets more than 100 broadleaf species, including wild violet, clover, garlic, and even more stubborn plants. mecoprop-p Acid, dicamba acid, and carfentrazone-ethyl all work together to protect against a wide range of weeds. As a contact herbicide, you can see visible results with Gordon’s SpeedZone in just hours. It takes about one to two weeks to kill weeds completely. One of our favorite things about Gordon’s Weed Killer is how much area it can cover. 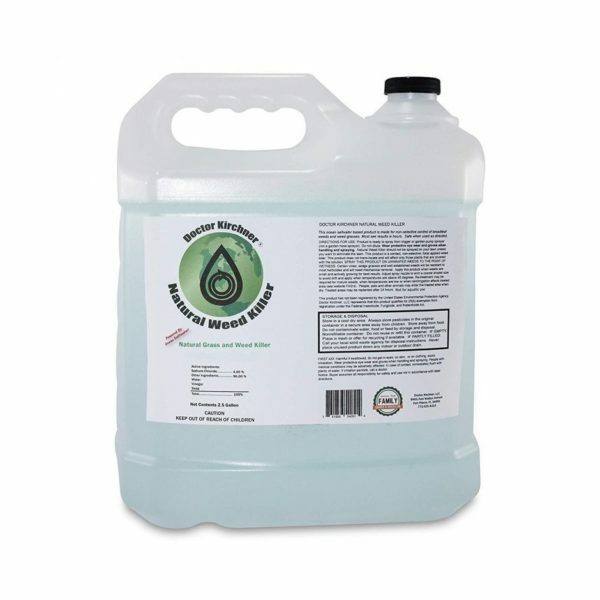 With just 20 oz of concentrate, you can make 20 gallons of product and treat between 14,000 and 18,000 sq ft of yard space, making it an affordable option for large properties. For those living in cooler climates, Gordon’s SpeedZone is optimized to work in the cold. Unlike other weed killers, which only take well when the weather is warm, Gordon’s is just as effective in the fall and winter as it is the rest of the year. Due to some of its stronger ingredients, this weed killer isn’t sold in all states. It can’t be shipped to Arkansas, Washington DC, Massachusetts, New Jersey, or Vermont. Can be used year-round thanks to a cold-resistant formula. Four active ingredients for more weed-killing power. Visible results in just hours. Completely kills plants in one to two weeks. Harms broadleaf plants without affecting grass. Restricted sale in certain states. May kill certain types of grass such as St. Augustine. Nothing ruins the look of a lawn faster than a weed problem. Fortunately, with the right herbicide, you can nip problems in the bud before they spread through your yard. Out of all the weed killers that we’ve tried, our clear favorite is the Compare-N-Save Concentrate. This product is not only affordable, but also effective. As a non-selective contact herbicide, it can help you to effectively wipe out unwanted weeds on the spot and keep your garden looking pristine.